Welcome to Autumn Colors in Pigeon Forge! 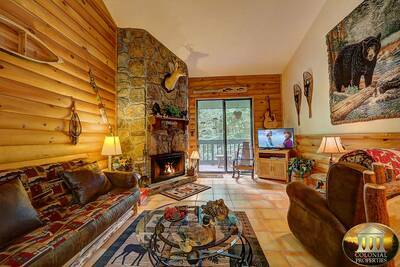 This amazing 2 bedroom, 2 bath Smoky Mountain cabin rental has so much to offer and is full of everything you will need to have the vacation of a lifetime! Once you enter Autumn Colors, you are immediately greeted by a breathtaking wall of windows that floods the room with natural light and allows you to enjoy the scenic and serene forest setting. The spacious, open and bright living area features a flat screen TV and is enhanced by a beautiful fireplace. Just in case you need to do a little work or want to check your email, Autumn Colors offers complimentary high speed internet access. Nearby is the fully equipped kitchen and dining area. The kitchen has all of the appliances and utensils you will need to prepare a delicious meal for your family and friends. Located off of the living room is the game room. Here you will find the full size regulation pool table, perfect for keeping everyone entertained for hours. Also located on the main level is the truly spectacular and romantic master suite! It features a king log bed, flat screen TV, large picture windows that overlook the forest and a relaxing oversized bedside jetted tub. Located next to the master suite is a spacious full bath for added convenience. Take a trip upstairs and you'll enter the loft area. It's the perfect spot to view the outdoors, read a book, or challenge your loved ones to a game of pool. You'll find the futon here for additional sleeping. Also upstairs is the second bedroom, featuring a queen log bed, TV and full bath. If you need to catch some fresh air and love the outdoors, then you'll absolutely love being at Autumn Colors! The covered front deck is the perfect place to enjoy your morning coffee or a quiet evening taking in all that Mother Nature has to offer. Located on the side open deck is a picnic table. Here you can enjoy a wonderfully prepared snack, lunch or just sitting around and sharing time with those you care about most. Also located on the open deck is a hot and steamy hot tub - the perfect spot to gaze at the night stars and enjoy the ultimate relaxation experience. Autumn Colors is conveniently located just a few minutes from downtown Pigeon Forge and all the attractions, shopping, entertainment and dining options the area is known for. 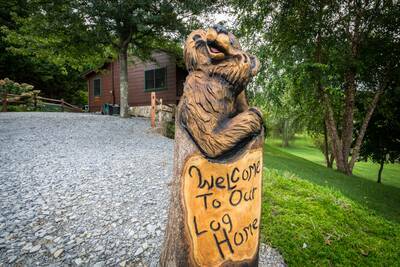 If you're searching for a Smoky Mountain cabin rental that allows you to truly enjoy the outdoors plus have all the features and comforts to make you feel right at home, then plan your vacation today at Autumn Colors. A: Hey Dana! There is a property location map located at the bottom of the cabin page. A: Autumn Colors is not a pet friendly property. A: Hi Cathy! Master King Bedroom on main floor. Queen Bedroom upstairs. Queen Sleeper Sofa in living area, and the futon is on the landing up stairs. A: Hi Jayden! You must be at least 25. “ What a wonderful cabin! We enjoyed the pool table and the many activities in the area. “ We absolutely LOVED every minute we spent here with our family of 5. 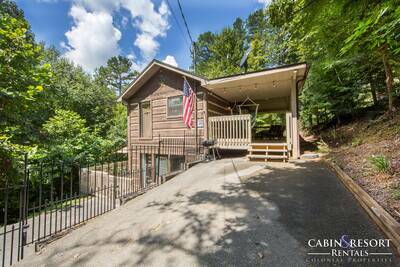 The cabin is located just up the mountain enough to enjoy the view, the wildlife (especially the raccoons) and the fresh mountain air. It is also incredibly convenient to any and all the activities with only a short drive. We look forward to spending more time here and making more family memories in the years to come. “ Everything was great! My husband and I were here celebrating our 17th wedding anniversary and thanks to you guys opening up your amazing home - It was amazing! We have never been away just the two of us without our children and the peace and quiet was much needed. We sat on the porch and enjoyed the fresh mountain air with coffee every morning - taking in just a little of God's splendor. We will be back! Thank you again & God Bless! “ Beautiful birthday weekend away, stunningly quaint little cabin with all the essentials. Until next year we will live off the memories. “ This cabin was just perfect for our family of four. Everything was well kept and I've never felt more at home on a vacation! Actually, I think the beds were more comfy than our own! We hoped to have seen a bear, but the only "friends" we made were some racoons, wild turkey, salamander and some scorpions! We got a kick out of all of them. We made some great memories this week! 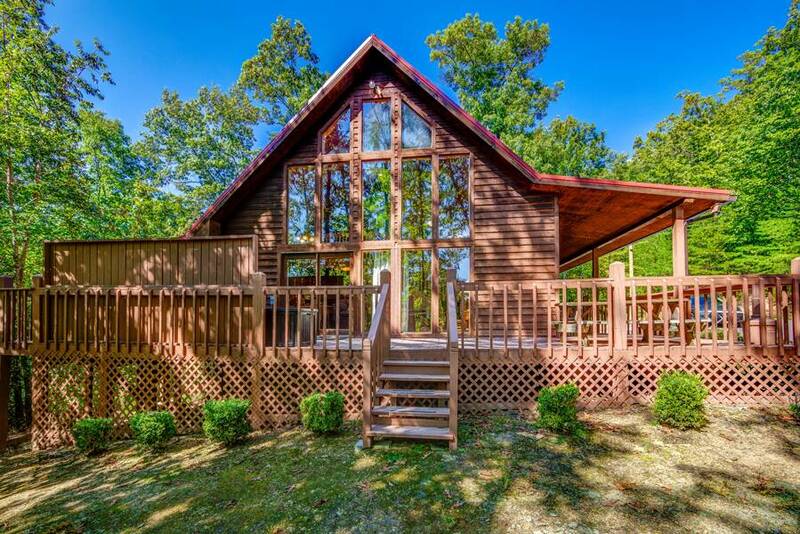 “ We are so blessed to have enjoyed such a beautiful, clean, peaceful cabin. Everything was perfect! The mountains are breathtaking! We enjoyed just the quietness of the area. It's hard to leave such a place of solitude. We continue to pray for everyone who enters will feel the awesome presence of Jesus. We can't wait for our next opportunity to return. “ Thank you for everything. We has such a great time staying here! This was probably the best cabin we have had up here so far. I know we will be coming back soon with hopes of seeing a bear. 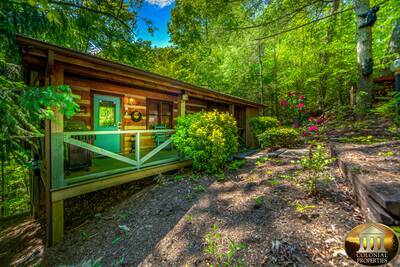 “ Thanks so much for creating such a comfortable & lovely cabin! We had a wonderful time and would love to come back again sometime. You know you learn something new with every trip - didn't know there were scorpions in this area! “ We arrived here at cabin. It is very well kept and clean cabin. We have enjoyed our stay here. We just have one suggestion that the tub upstairs is very slick. Needs something on the bottom. We are from Indiana and on spring break. We really enjoyed the Smoky Mountain Opry and Hatfield and McCoy Dinner Show. My daughter, granddaughter and I were chosen to be part of the show at the Hatfield and McCoy Show. Thank you for letting us stay here. Hope to visit again. “ Thank you! Everything was perfect for our stay here. My family has had great time. Your home was amazing. My grandchildren saw things they will never see again. 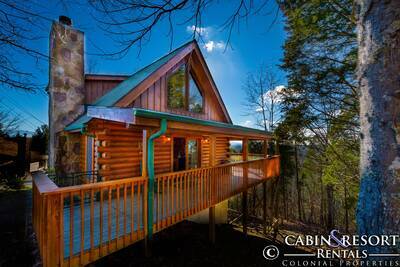 “ The cabin was beautiful and clean. They called to make sure we made it there safe, and called to thank us for our stay. We will be back for another vacation! “ We came up here just for some "us time" and we truly enjoyed it. It is so beautiful and peaceful up here. Thank you so much for sharing your little peace of heaven on earth. “ Memories were made this weekend that we will treasure forever. Our stay at Autumn Colors was absolutely perfect! We couldn't have asked for a better view or cabin. Watching the sunrise from the front porch and listening to nature was the perfect way to start our day. We will be back and are already looking forward to our next vacation here. “ We have had an awesome week in your cabin. We came up here with our whole family. This trip was planned around our 50th wedding anniversary! This cabin was warm, inviting and very comfortable. We just loved the front porch and sitting out there every morning with conversation and coffee. Barney actually saw a bear near the porch on our first morning here. He excused himself very quickly and gave him the porch! The only other person who saw him was our daughter Kelly - she ran into the road to see him causally amble up the road! It was exciting for them! We had a great week with many activities and several shows. The family surprised us with a wedding chapel ceremony where we exchanged vows again after 50 years of marriage! After that we had a wonderful dinner with our friends from out-of-town who surprised us for the 2nd wedding. It was a wonderful day. We are so blessed and we thank God everyday for all He has blessed us with. Thank you - We loved your cabin. 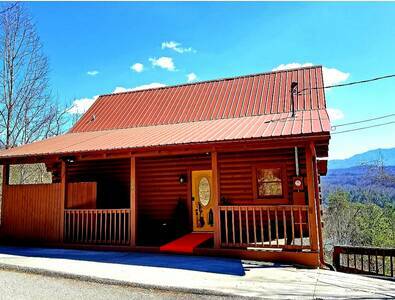 “ The cabin was beautiful and very well kept!!! “ Arrived at the cabin, extremely well kept and nice. The family really enjoyed themselves and are really looking forward to coming back in four weeks. Hopefully next time we get to see a bear. YAAAY!! God Bless and Thanks! “ Truly an amazing cabin. Well kept, clean had everything we needed. The porch light was out when we arrived looked for a spare bulb but there wasn't one available for it. Made a call in the morning and they had it fixed up that day. Colonial properties does a really great job maintaining the properties. The cabins far enough away from town to really enjoy the peace and quiet, but not to far away from town, I'd say about a 10 15 minute ride tops into town. Definitely looking forward to going back, and recommend to my family and friends. “ We absolutely loved every minute we spent here with our family of 5. The cabin is located just up the mountain enough to enjoy the view, the wildlife (esp the racoons) and the fresh mountain air. It is also incredibly convenient to any and all the activities with only a short drive. We look forward to spending more time here and making more family memories in the years to come. “ I really enjoyed my stay here. So peaceful and the scenery was beautiful. What a refreshing getaway. I can't wait to tell my mom all about it. Will return soon! Thanks! 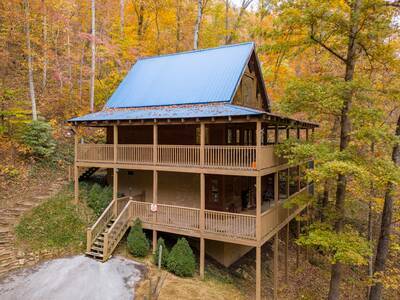 “ This cabin was well kept and we felt right at home the entire time. 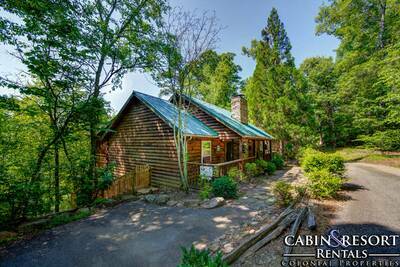 We loved the peacefulness of the location and would recommend this cabin to our family and friends. “ Everything was wonderful! We came out here to celebrate our 15th anniversary and have enjoyed every minute of it. We didn't go into town and instead spent all our time here enjoying the beauty of this place. We are from Illinois. We plan to come back again but next time with all three children. Thank you so much for opening up and sharing your home with us. Also, my husband was able to see a bear one night here.